BB NOTE: No worries, the Darth Vader Gargoyle appears to be unharmed. Cathedral damaged from earthquake, including its spires. An unusual magnitude-5.8 earthquake that struck in central Virginia during the early afternoon Aug. 23 significantly damaged the central tower of Washington National Cathedral about 84 miles to the northeast. 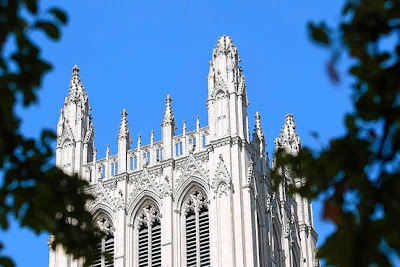 Cathedral spokesman Richard Weinberg told Episcopal News Service by phone later in the afternoon that the finials or capstones, which are shaped like fleurs-de-lis, fell off three of the four pinnacles (corner spires) of the "Gloria in Excelsis" central tower. There are also cracks in some of the flying buttresses around the east end of the apse, and pinnacles fell from the west front and the apse, he said. The east end is the oldest part of the cathedral. The buttresses around the central tower seem to be sound, according to a late-afternoon press release from the cathedral. And, despite some cracks on upper floors in the interior, no damage to the stained-glass windows has been reported. The cathedral was evacuated, said Weinberg, who estimated that about 300 people, including staff, were in the building when the quake occurred. The cathedral will remain closed at least for the rest of the day as engineers and stonemasons assess the building. Weinberg said it is not known when the cathedral will re-open to visitors.